The 46th Sehsüchte International Student Film Festival took place from Wednesday the 26th of April to Monday the 1st of May at the Film University Babelsberg in Potsdam, Germany. The film “Watu Wote_ (All of Us)” was screened at the opening ceremony and it elicited a range of reactions from the audience. Audiences were deeply moved by the story which is based on real events that took place in Mandera in December of 2015. They were also impressed by the quality of production from young talented filmmakers. This set an incredible base at the beginning of the festival and “Watu Wote” was the subject of many conversations up until the closing night. The film took home two awards: The Audience Award and The Award for Best Production. It adds these two awards to the Best Short Film award that it won at the San Sebastian Human Rights Film Festival early in April. “Watu Wote” centers on a group of individuals in a bus who are attacked by terrorists. The religious divide is bridged when two religious groups come together and defy the odds by fighting a common enemy. Matrid Nyagah and Tobias Rosen represented the film in the producers’ panel session where they discussed the opportunities and challenges in International Co- producing. Among others examples Watu Wote provided a good case study on the do’s and don’ts when looking for an International Production Partner. The Film was produced by Tobias Rosen of Hamburg Media School and Bramwel Iro and Matrid Nyagah of LightBox Africa. 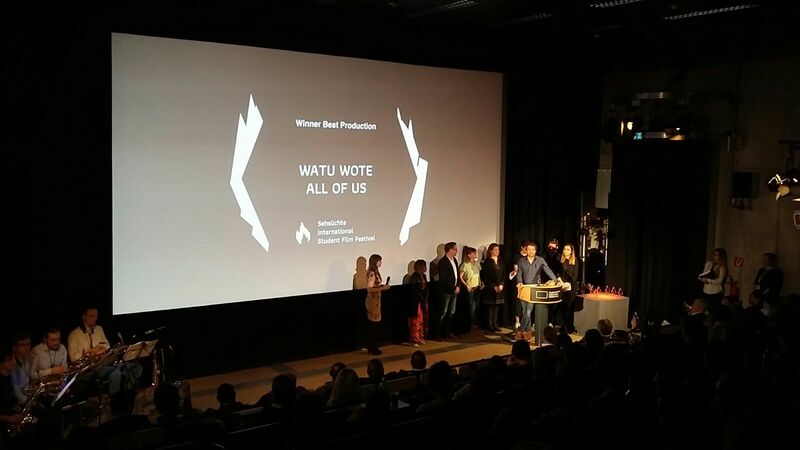 Congratulations to the entire Watu Wote Team!